Reply concerning Miss Fraser, presumably to Dr Skene. Cullen says that from what he saw of the patient, 'I am persuaded that if not the whole the greatest part of her ailments are feigned'; he wrote the preceding letter (ID:3846, which was presumably enclosed with this one) 'to be ostensible, and here I give you my real opinion', as it might put her mother 'out of countenance'. Summary Reply concerning Miss Fraser, presumably to Dr Skene. 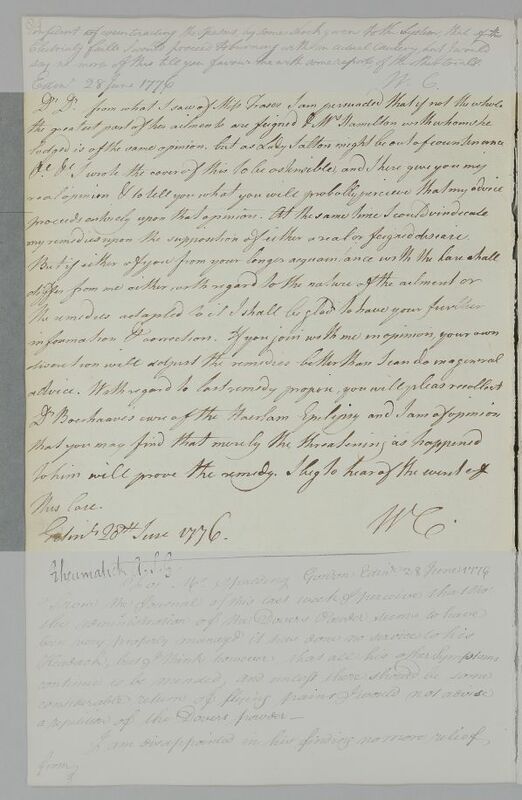 Cullen says that from what he saw of the patient, 'I am persuaded that if not the whole the greatest part of her ailments are feigned'; he wrote the preceding letter (ID:3846, which was presumably enclosed with this one) 'to be ostensible, and here I give you my real opinion', as it might put her mother 'out of countenance'. Case of Miss Fraser who is suspected of feining her fits. my remedies upon the supposition of either a real or feigned disease. 1: Secret: i.e. not to be shown to the patient, Miss Fraser, who is thought to be falsifying symptoms, nor to Lady Salton who might be offended by this accusation. 2: The Dutch physician and botanist Herman Boerhaave (1668-1738). Although Boerhaave discusses epilepsy and mentions Harlem (a town in Holland), several times in his numerous published works, this precise allusion is untraced. The implication is, however, that the case concerned a placebo effect.